THE TRADE war between the United States and China is set to heat up. On March 2nd Donald Trump is scheduled to increase American tariffs from 10% to 25% on $200bn of imported Chinese goods. Last week representatives from the two sides held preliminary talks that ended on a surprisingly good note, spurring hope that Mr Trump might cancel his planned escalation. He would be wise to back off: recent research suggests that ploughing ahead will not only harm his country’s economy, but will also fail to reduce America’s bilateral trade deficit with China. A new paper submitted to America’s National Bureau of Economic Research reinforces the prevailing view that tariffs harm a country’s economy, and finds that this damage lasts for a surprisingly long time. Davide Furceri and three co-authors calculate that increasing tariffs by a single percentage point corresponds to decreases of 0.12% and 0.23% in GDP and labour productivity, when measured five years after the shock. In exchange for such costs, trade warriors hope to reduce their trade deficits. But the researchers found no statistically significant long-term association between rising tariffs and subsequent changes in trade balances. 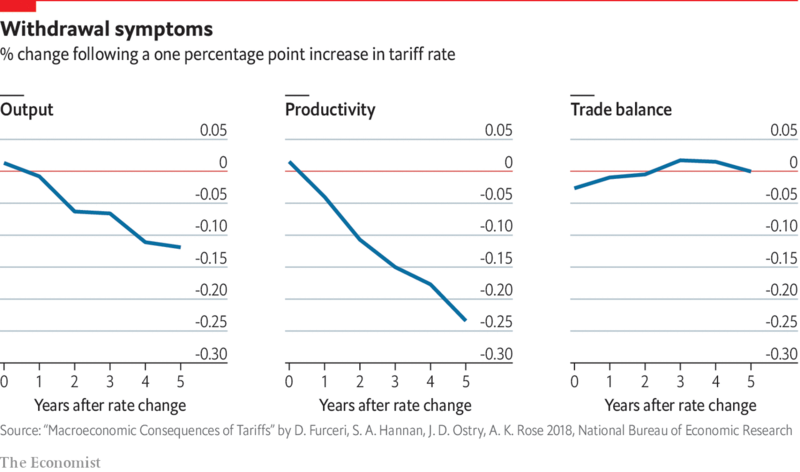 They actually deteriorated slightly in the year tariffs were increased (see zero “years after rate change” on trade-balance chart), and after five years wound up right at their level before the policy went into effect. Because Mr Trump’s tariffs are limited to specific goods and trading partners, their effects may differ significantly from these estimates. However, America is already feeling some of the costs of its president’s protectionism. China was the largest market for America’s soyabean exports in 2017; it reduced its imports of the product by 94% last year. Correspondingly, the market price of a bushel of soyabeans has fallen from nearly $11 early last year to $9 today. And although Mr Trump vowed to be an ally of steelmakers, shares of American steel companies have fallen by 22 percentage points more than the stockmarket as a whole since he announced the tariffs, thanks to concerns over falling exports, retaliatory tariffs and the uncertain future of trade policy. Mr Trump may need to abandon his “Tariff Man” agenda if he hopes to ride a strong economy to re-election in 2020.